On Wednesday, June 18th, ARCK will be joining up with Future Boston Alliance at the Museum of Fine Arts to celebrate the second annual Juneteenth Celebration, the commemoration of the ending of slavery in the United States. 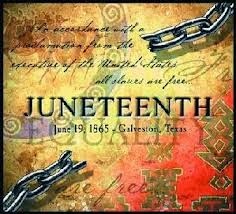 June 19th has been celebrated as African American Emancipation Day since its origins in Galveston, Texas in 1865, and has since spread across the country. It is a free event, with programs ranging from speakers and performers to picnics. Click here to find out more and register.